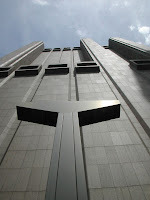 I've stumbled past the building in NY many a time. Everyone I'm with comments on it. It's really an ominous building. No windows. Very tall. No signs anywhere! And lots of security features - gates, cameras, etc. Well I finally spent a bit of time on Google finding out what it was. It's a telco hotel. Basically a telephone hub from which a lot of the hard work of moving and storing and routing bits is done. Now I kind of figured it was a telco hotel but there is another building nearby that is a telco hotel so I assumed it couldn't possibly be one as well. Turns out it is. There's a lot more information here. In keeping with it's weird appearance the type of architecture is known as Brutalist. A style typically known for its use of concrete, repetitive features, and complete lack of windows or at least big windows. Think the J. Edgar Hoover building in DC. Anyway. Now I know.